Hey, Hey!! How's my Lawnscaping friends doing!? Welcome to another new challenge!! I had fun with this one!! I used some of the new papers from Let's Polka, Mon Amie! I absolutely love everything about this paper pack! Of course, the simplicity of the dots, stripes and hearts, but the colors...THE COLORS! The pale vanilla yellow color and the mint are my favs!! So anyhoo - Back on track! I wanted to create a fun card that could easily bring a smile to a friends face! I think I accomplished it! 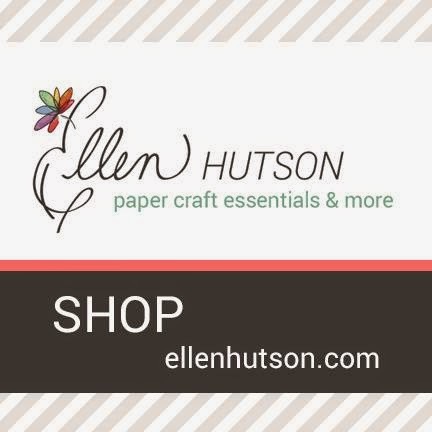 Before I get into the details of my card - I need to give a shout out to our wonderful sponsor - Ellen Hutson! This shop is awesome, and the customer service is just as awesome! 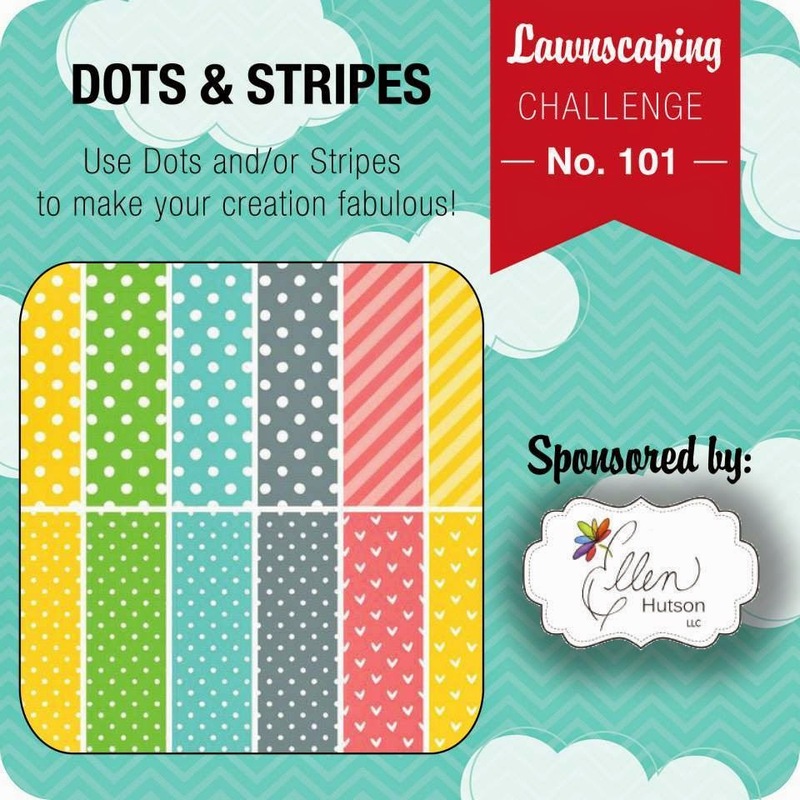 They will be giving the winner of this challenge a $25 dollar gift certificate, so if that sounds good to you - be sure to link up your project over at the Lawnscaping gallery! Like I said in the beginning - I had fun making this card ( not to say I don't with others I make) but this one I was feeling the creativity! I knew I would - simply for the fact that I was using all new Lawn Fawn goodies! I've been in a creative slump lately even though I've been putting out projects - I've really had to force the creative juices. So - I used the fun new set Let's Play! One of my favorites from the entire new Winter Release. I inked up the little dog ( isn't it too cute! ), one of the birds and the Titter Totter image! I used Lawn Fawn's new Black Licorice ink - which is a very bold crisp ink! I inked all the images it with this ink except for the dog, and I used Hero Arts Cup o' Joe ink for it. I stamped out the dog, and die cut it with its coordinating die, and then stamped it out again onto a piece of the brown striped papers from the Polka Mon Amie papers and fussy cut that out and paper pieced it onto the die cut dog ( so cute ). Then, I stamped the bird and colored it in with my Copics ( BG13 & YG41). 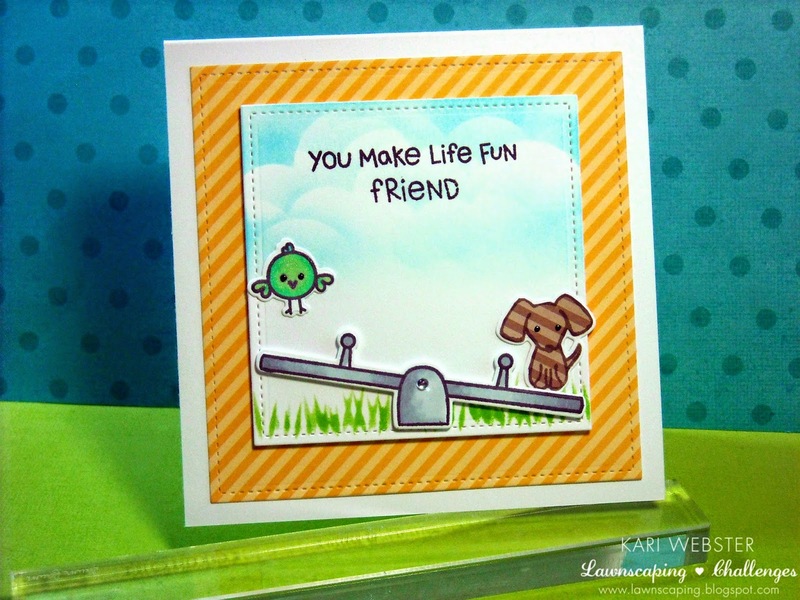 I then stamped the teeter totter and colored it with C1, C3 and C4, and then die cut it out as well with its coordinating die. I set aside all of my pieces, and worked on my background of my scene. I have a stencil that I used for the grass, and I die cut a piece of copy paper from a cloud die to make a stencil, and inked up my sky/clouds with Tumbled Glass Distress ink. I created my card base from smooth white card stock and make a 5x5 inch square card. I die cut from more of the Polka Mon Amie papers with the Stitched Square Stackables ( Small and Large sets), and I put my card together. 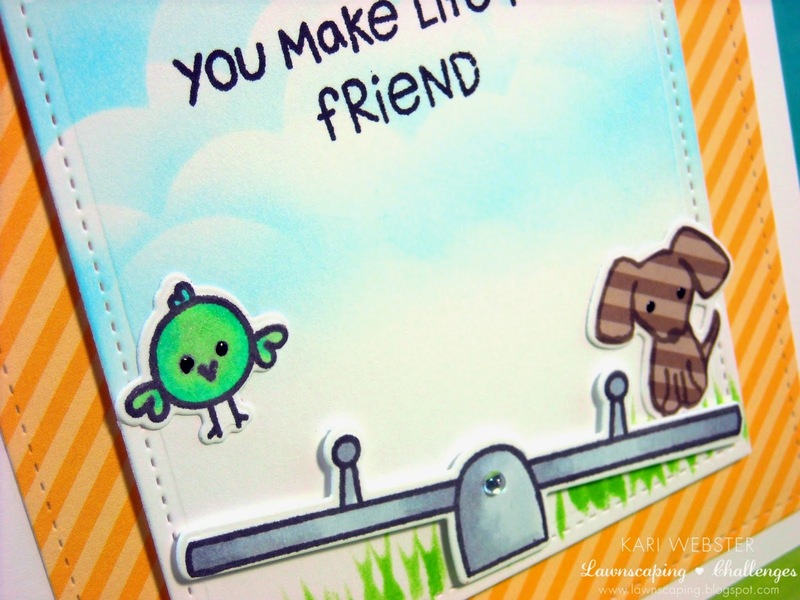 I put foam adhesive on the teeter totter and adhered it to my main panel on top of the grass, and I adhered the dog and bird straight onto the card with my liquid adhesive. I adhered foam adhesive to my main panel, and adhered that onto the striped pattern paper. For the sentiment, I inked up the sentiment from the same set - You Make Life Fun and I carefully inked up the sentiment friends leaving off the "s". To finish off my card, I added some Wink of Stella to my bird, some Black irRESISTible Pico Embellisher, and a gem in the middle of the teeter totter. I hope you love this card as much as I enjoyed and loved making it!! Hope to see your creation over at the blog in the gallery!! See you soon!